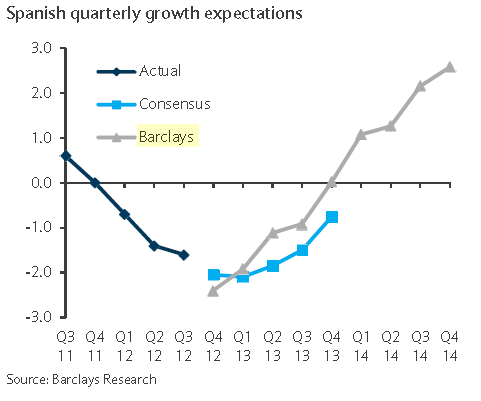 Unlike Goldman, whose economists do not expect Spain's GDP growth to turn positive until 2015 (see post), Barclays is projecting a much quicker recovery. They take a somewhat "contrarian" approach to the Eurozone periphery. Barclays however expects Spain's bonds to come under some pressure in 2013 because the financing needs may be higher than the government is currently projecting. The risks include the need for Spain to issue additional paper in order to fund the regions (see post) as well as the ECB requiring Spain to cut its dependence on short-term funding (via bills). Such scenarios would most certainly involve Spain activating the OMT program. Barclays Capital: - ... there is a high risk that in 2013 regional issuance might be merged with that of central government, which might bring further upside risk to the government bond issuance. In our central scenario, we forecast bonos issuance for next year at c.€102bn and €40bn in gross and net terms, respectively. In a pessimistic scenario, in which the ECB is not happy with the excessive dependence on T-bills and there is upside issuance pressure from regions on the bonos issuance, we would expect the gross and net issuance numbers to be €130bn and €55bn...[that's the "Barclays worst case" below].